send the final artwork over to Photoshop to give it an aged appearance with texture overlays. common aesthetics and mix and match the different elements to create your own custom design. various features displayed on the authentic examples. Open up Adobe Illustrator and create a new document. set to Millimetres and a portrait orientation. it, then for the same reason the color mode is set to CMYK. A retro style colour scheme is the foundation of any retro design. I used Coolors to find a cool palette. to narrow down your selection. You can either note down the hues, or take a screenshot of the page. Use the Eyedropper tool and hold Shift to sample each hue from the image. draw a shape to cover the entire artboard, including the bleed area. To avoid accidentally moving this background out of place, go to Object > Lock > Selection. first stripe and give it a fill from the palette. rectangle and adding more stripes. Add an extra 3 to make 5 stripes. shape by holding the CMD key. it down in size vertically. to Object > Blend > Make. Steps, then alter the number of lines to create a gradual reduction in size. Before adding the text elements, use the Rulers to add guides around the edge of the artboard. 10mm to add a margin around the edge to help balance the design. when you're done to avoid accidentally moving them out of place. 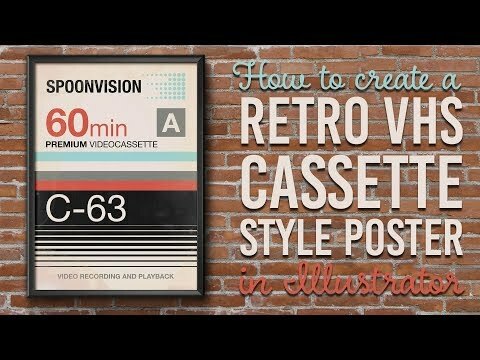 Begin setting out some text elements with inspiration from authentic VHS covers. the same fill as the background colour effectively knocks out this black strip. the elements, as well as adjusting the size and colour. it doesn't move out of place, then use the Align panel to centre them up. to mix up the different type elements. This area of the design is typically where the logo is placed. The original VHS covers often have little pattern graphics made up of dots. We can also create this kind of effect with the Blend tool in Illustrator. Draw a circle, then hold the ALT key and drag a copy off to the side. Reduce this circle down in size while holding both the ALT and Shift keys. With both items selected, go to Object > Blend > Make, then go straight back to Blend Options. Change the settings to Specified Steps and evenly space out the dots. Go to Object > Expand, then Ungroup the elements. Add a further 5 rows with the CMD+D shortcut. so let's transfer it over to Photoshop for some ageing. When you open up the Illustrator file in Photoshop the dimensions will be preserved. Select All, then Copy and Paste into the main canvas. the stains of the texture to be applied to the artwork. You can tone down the effect by reducing the opacity of the layer. texturing to the darker portions of the artwork. The final result is a cool retro style piece of artwork inspired by old VHS cassette covers. If you enjoyed this tutorial be sure to leave a thumbs up on the video. Graphics website to grab my free resources bundle. Thank you very much for watching, and I'll see you in the next one.